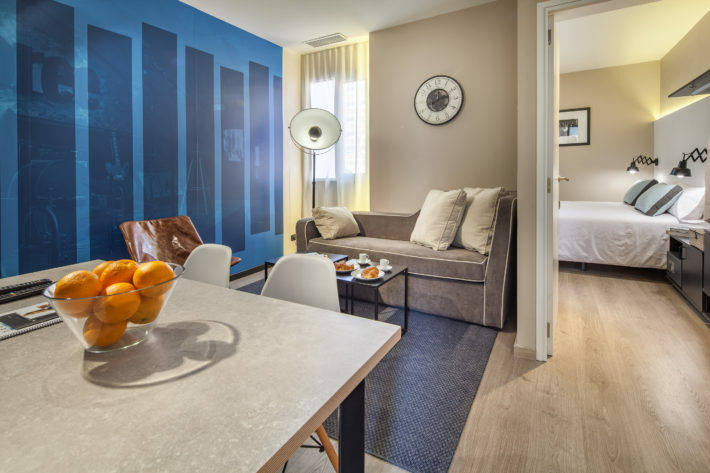 The JAZZ BCN Apartments are all situated in two buildings – Hot Jazz and Cool Jazz, both of which feature and portray the musical genre in Cool & Hot ways. Cool Jazz apartment complex is located a minutes’ walk from the Hot Jazz one, and both of the complexes are situated in the central Eixample area. 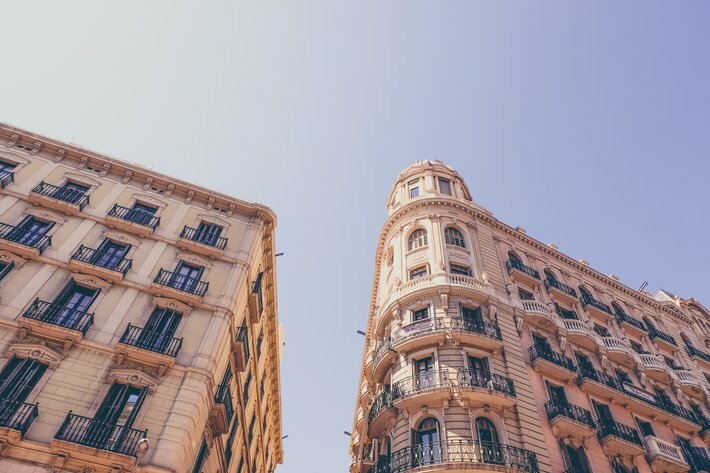 The geometrical grid of Eixample is a district with a very vibrant atmosphere in the daytime, offering many restaurants, bars, cafes, various boutiques, and stores, as well as plenty of sights to visit. The district is not as touristy as the old town, which is very convenient because of the tranquility at night. The district is famous for the unique facades of each building, so keep your head up to admire the cute balconies and big windows of houses in Eixample. The most popular sights nearby apartments are both UNESCO World Heritage Sites and attract millions of tourists each year! 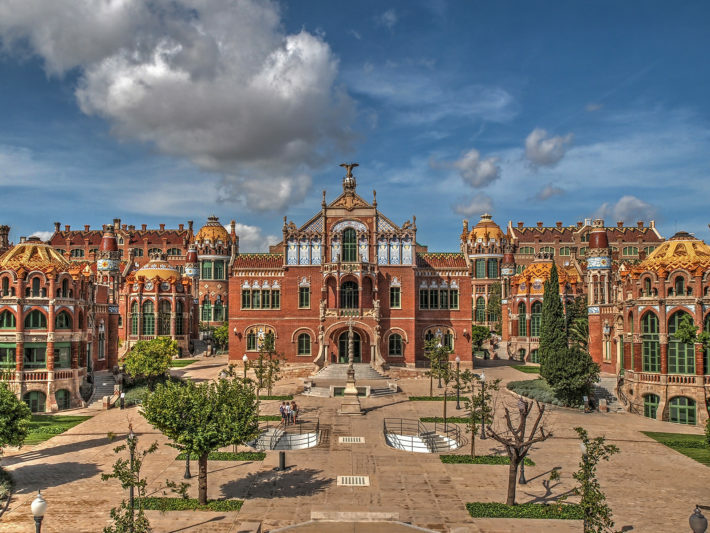 The hospital was designed by the Catalan Modernist architect Lluís Domènech i Montaner and built at the beginning of 20th century and now stands as one of the symbols of Catalan Modernism. The idea for this astonishing building was to make it a place patients would enjoy being treated at, and the details of the building and the gardens show exactly that. It was a fully functioning hospital up until June 2009, when it was refurbished and opened as a museum. Visit the official website of the former hospital for more information, opening hours and tickets. The famous church can most likely stand top of the list of sights in Barcelona. 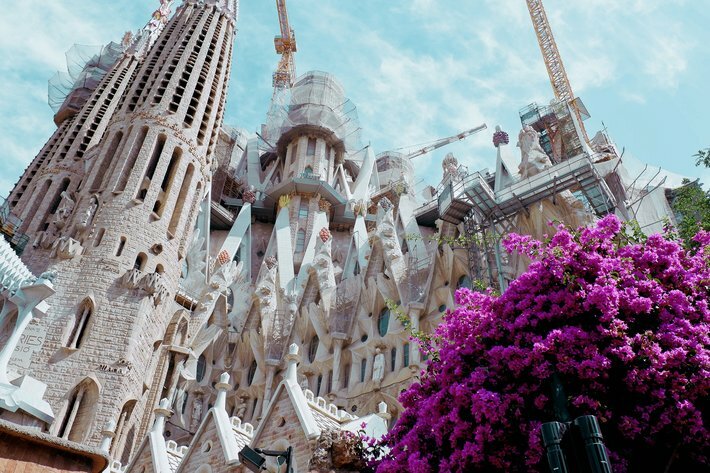 Designed by Antoni Gaudí, the astonishing monument has been under construction for more than 140 years since the famous architect took over the project and is the world’s largest unfinished church (planned end date is this decade though, fingers crossed!). When the building is finished, it will be the tallest church in the world! One of the reasons the church is such a one-of-a-kind monument is that it combines such styles as Catalan Modernism, Art Nouveau, and Spanish Late-Gothic as well as Gaudí’s personal original touch. Stained glass, vaults and many other details both in the interior and exterior of the church add to the overall majestic feeling, visit and find out for yourself! A little tip – buy your tickets online to avoid queues. When you are done exploring the beauty of Eixample district, you can use public transport to see much more! There are two underground stations nearby the JAZZ BCN Apartments: Sant Pau / Dos de Maig (serviced by metro line L5) and Sagrada Familia (serviced by metro lines L2 and L5), both of which will give access to everything in the city! Take a look and book the Jazz apartments to have a vacation of your dreams in a modern and comfortable apartment!